Oregon’s Heisman Trophy-winning quarterback, Marcus Mariota, scrambled left, cocked his arm and let the ball fly. Eli Apple intercepted it at the Ohio State 25. The clock read 0:00. 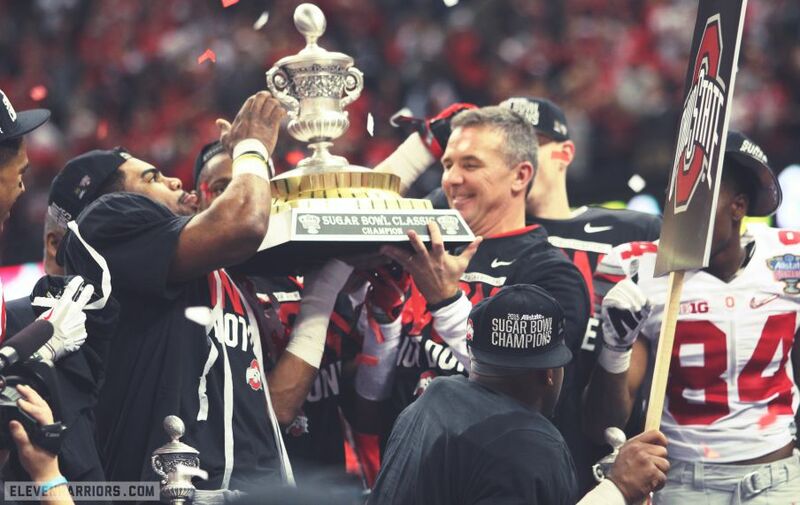 The Ohio State Buckeyes were national champions and my long nightmare was finally over. The previous sentence might seem a bit confusing if you never read this story I wrote a year and a half ago. It chronicles my greatest sin as a sports fan and my deepest shame as a Buckeye. For the TL;DR crowd, it simply talks about how I turned the TV off thinking Ohio State had lost to Miami in January of 2003. The haunting begins. I shut off the TV and heaved the remote a beat before the flag came. Seven days ago, I went through my day like a happy idiot, too exhausted after only an hour or so of sleep to be of much use to anyone, and too euphoric to care about that. In the week since, I’ve gotten a bit more sleep, but that happy feeling remains. It’s just a word, but one that now resonates with me in a way it never has before. After all, the last time the Buckeyes won a football championship, I found out about it seven hours after the fact—after a restless night of tossing, turning, and generally hating the world. The lessons I learned from that angry, petulant evening watching (almost all of) the 2003 National Championship stuck with me. I never considered turning the television off in 2007 or 2008, regardless of how many points Ohio State trailed Florida and LSU. But those losses only reinforced my self-loathing for my actions on Jan. 3, 2003. I’ve wondered this many times in the 12 years since that night. I was sure it would happen in 2007 and hopeful it would in 2008, but neither came to pass. The only thing to come out of those two games was the narrative that the SEC was king when it comes to college football. The 2010 team had a shot, but it fell at Wisconsin, and in retrospect it would have all been wiped away anyhow in the wake of Tatgate. That might have been more painful still—to have won it only to have it stripped away. 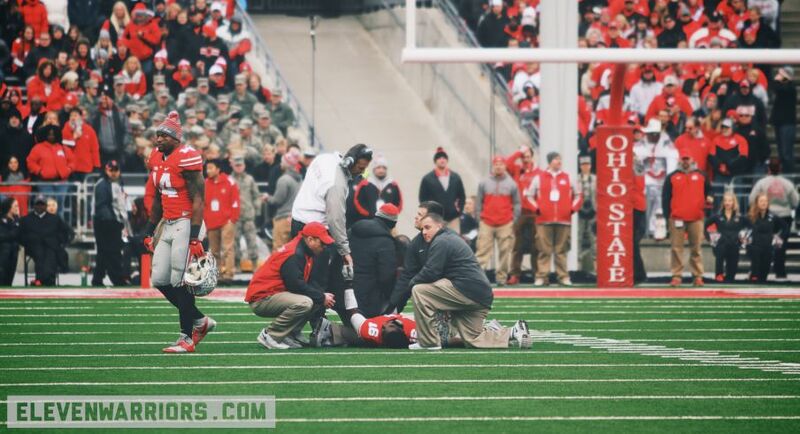 When Braxton Miller went down with a catastrophic shoulder injury, just days before the season would start, I shelved any expectations for the 2014 season. My hope was for a 9-3 campaign and a decent bowl game—perhaps in Orlando, my current hometown, so I could see the Buckeyes in person. 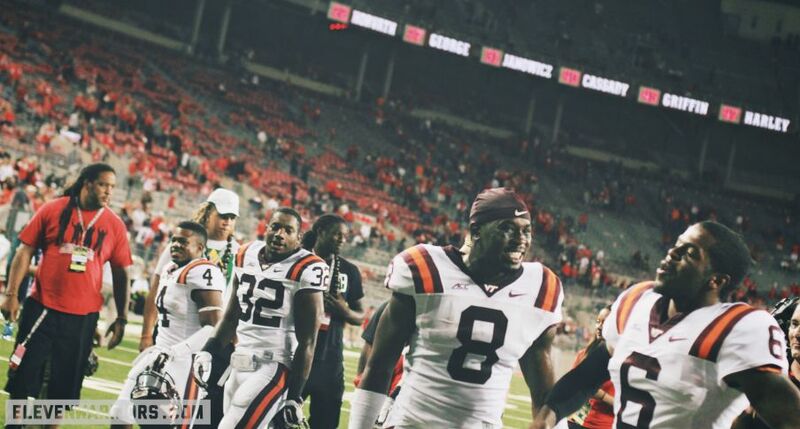 Who knew, after Virginia Tech, that this year's Ohio State team could win it all? The loss to Virginia Tech was disappointing but not shocking. The next test would be Cincinnati in the Shoe, my lone trip north for the fall. The offense was amazing but the defense did not look ready to compete for a conference championship, let alone a national one. I enjoyed the weekend with my fellow 11W bloggers, old friends and a few new ones, then I flew home, never thinking this Buckeye team was anything special. In the middle of the year, the team started putting it together. J.T. Barrett got better every week and the pass defense started to limit big plays. The team beat conference newbies Maryland and Rutgers easily enough, but struggled to get past Penn State. Again, I thought about a 9-3 year. The Buckeyes crushed Illinois. The trip to East Lansing was the first sign that perhaps this team could win the Big Ten and maybe sneak into the College Football Playoffs. It was, in the end, a fairly easy win over a solid opponent. I stopped thinking about 9-3 and started considering the team capable of getting to the B1G Championship Game without another loss. 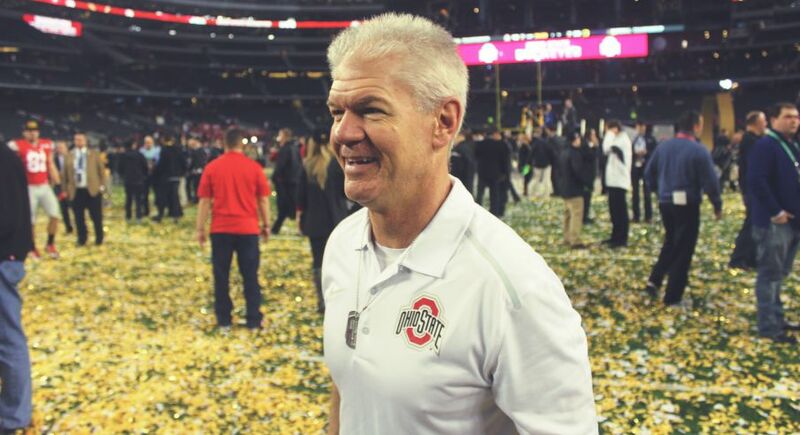 Another seemingly fatal blow to Ohio State's season came in last quarter of The Game. There weren't any Ls in the win-loss column, but Barrett’s injury early in the fourth quarter seemed like a devastating blow. At that point, I just wanted to hold on and beat TTUN. I didn’t see a way to beat Melvin Gordon and Wisconsin with a suddenly suspect rush defense that had been torched by Jeremy Langford, Tevin Coleman, David Cobb and, until his own injury in The Game, Drake Johnson. And I didn’t see a way to beat a good team with a third-string quarterback with only a week to prepare. So, 59-0 happened, and suddenly it was a question of whether or not the Buckeyes would be included in the College Football Playoff. The committee was convinced. Ohio State was in. Its reward? A date with Alabama in the Sugar Bowl. The Buckeyes had been playing with house money since Miller’s injury. There weren’t many expectations. We all seemed happy with the wins and most folks I talked to were of a like mind—a win over Alabama would be nice, but the season, given the circumstances, was already a success. But the Buckeyes weren’t finished, and rode Ezekiel Elliott’s legs, Cardale Jones’s arm, the bodies of the slobs up front and a resurgent defense past the Crimson Tide and into a date with Oregon in Dallas. I began to believe it was possible. The season was already a success to me. No one could have envisioned a Miller-less Ohio State going 13-1, knocking off Bama and reaching the National Championship, but there we all were last Monday night, watching it happen. When the improbable finally seemed possible. The Ducks sliced down the field for a quick touchdown. It was all good. House money. Oregon stopped Ohio State’s first drive. No worries. We’re not even supposed to be here. At this point, I was simply hoping the game would remain fairly close. Then the Buckeyes got up off the mat. They took their standing eight count and started punching back. And punching. And punching. Ohio State, in fact, dominated the game. If not for the Buckeyes' sudden penchant for turnovers, the Ducks would have gotten run out of Jerryworld in a laugher. Instead, Oregon crept back into the game, closing to 21-20 on a field goal in the third. That one-point lead would have been a deficit if not for a heads-up play by Apple in the back of the end zone, pushing Evan Baylis over the end line. After that, the Buckeyes stopped stopping themselves, scoring the next 21 points. As the clock started winding down, I never dared think the game was over. This was Oregon. It was the most prolific offense in college football. The Ducks could score on any play. No lead was safe. Ohio State went up by 15 points with 9:44 to play on an Elliott run. Nope, not over. I had gone from calm and satisfied to terrified. The Buckeyes forced a punt with 7:40 remaining. Still lots of time. The Buckeyes ran 3:23 off the clock, but were giving it back. Still not over. The Ducks went minus-one yard on four plays, turning the ball over on downs at their own 14 with 2:45 still on the clock. Oregon had timeouts left. I started an internal debate over whether to try a field goal on fourth down or go for it to pin them deep. Jones ran for two yards and Oregon called timeout. Elliott ran for five…and for some reason, the Ducks didn’t stop the clock. Elliott ran for two more. Still no timeout. Ohio State had a fourth down and would go for it. Oregon jumped offside! First and goal. I...well, I didn't exactly relax, but I finally felt like it would happen. It would take a rather sizable collapse to prevent a championship. Still, the Ducks had those two timeouts. This vexed me. It didn’t vex me for long. Elliott powered into the end zone two plays later and finally I allowed myself to feel—the moment, the last 12 years, that night long ago in January of 2003 all hit me simultaneously. My eyes filled, my tears blurring the final few plays. Apple intercepted the last pass. I articulated…something. It wasn’t a word, but some sound escaped me. Joy? Vindication? Relief? All of these, certainly, but more. Self-forgiveness was in there somewhere. And something more morbid…a sense that if I died, at least it was after having seen the Buckeyes win a championship. You never know how many of these things you’ve got left, and at 48 you feel that much more than you do at 28. I wept. I smiled. I tried and failed to tweet witty things. I watched as yellow (?!) confetti fell and trophies were presented, and the most improbable, insane, wonderful team of believers I've ever seen celebrated inside a giant monument to Jerry Jones’s ego. And above all the happiness and euphoria and relief, I felt…closure.